We cannot think of a world without batteries. We use batteries for our everyday use like mobile phones, digital cameras, remote controls and so on.Â But still we cannot tolerate the fact that these batteries die with time. They may have to be either replaced or recharged. Some of them are even heavy as well as bulky that you cannot just carry around. A clear solution to all this is the introduction of batteries that can be charged and recharged with the help of our blood and sweat. Â­Scientists from the Rensselaer Polytechnic Institute [RPI] have lately created such a battery that can use human body fluids like blood, sweat and also urine as an electrolyte for the battery. According to their research, they prefer to distinguish such a battery as a bio-battery that run on organic compounds similar to body fluids. The battery is essentially made up of cellulose and is thus defined to be a form of paper. The rest of it is made up of aligned carbon nanotubes. This will help the paper to obtain its conductive abilities and thus will also cause the battery to be light weight and also small in size. As the electrolyte is available as long as humans are alive, this type of battery is also ideal for medical applications. Â This battery can also be made in the shape of long sheets, which can later be designed in the shape of custom batteries. These long sheets can be joined together to provide power for medical equipments like pacemakers, and other advanced prosthetics. This will also be a stepping stone to a much more advanced artificial heart. Due to its small size, the battery can easily be setup under the human skin without much discomfort. The body fluids which are used for this battery includes blood, sugar and also human blood glucose. As the ionic liquid used for these batteries work at higher and lower temperatures [from almost -100 degrees Fahrenheit to almost 300 degrees Fahrenheit], this technology is also applicable to mechanical innovations. The RPI researchers also claim that their battery will be apt for higher energy applications. It can also be used as a super capacitor, a component which causes large, quick bursts of energy. As the composite of the battery are not any external chemicals, the battery is very much environmental friendly. The researchers are trying to figure out the best possible way of production and are also trying to increase its efficiency. Hope, this new innovation will be a success and become a stepping stone for the upcoming technology boost. As the electrolyte is available as long as humans are alive, this type of battery is also ideal for medical applications. 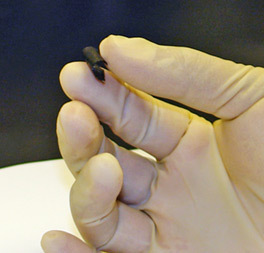 Â This battery can also be made in the shape of long sheets, which can later be designed in the shape of custom batteries. These long sheets can be joined together to provide power for medical equipments like pacemakers, and other advanced prosthetics. This will also be a stepping stone to a much more advanced artificial heart. Due to its small size, the battery can easily be setup under the human skin without much discomfort. The body fluids which are used for this battery includes blood, sugar, sweat, and also human blood glucose. THX Audio Engine – The Best Speaker Concept!! Contact Lenses with â€œThe Terminatorâ€ Mode!! I like this idea, one day the world my not need the carbon credit, environmentally friendly technology is the way to go. Thanks to your good work. CANT WE USE URINE AS A DECOMPOSER AS IT HAS UREA.